Live out your fishing dreams, charter the mothership for your next unforgettable fishing trip. Get a group of your best mates or family together and take the Tag Along trip! 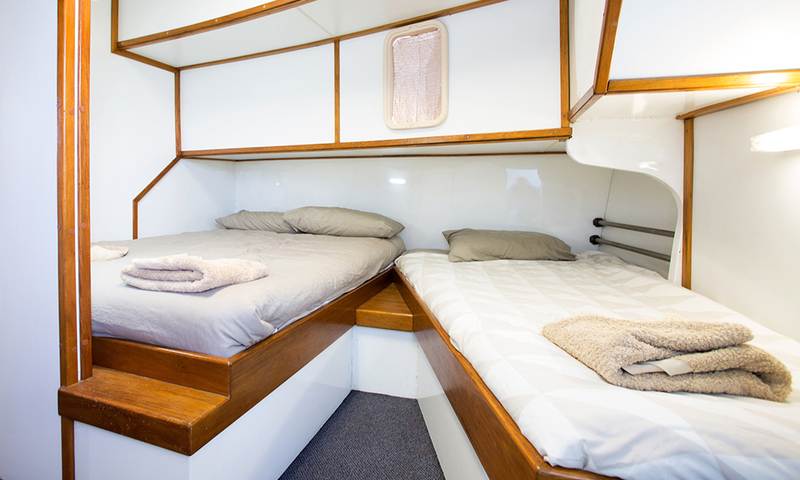 It is best experienced as a 6 night, 7 day charter where you live aboard the mothership in style and comfort while fishing remote Territory locations. As we depart Darwin with your boats in tow, you kick into holiday mode as your skipper steams to the fishing destination. You arrive early morning all rested and ready to fish the peak fishing times only minutes from the mothership. After fishing each day return to the mothership to cool off and watch the sunset on the top deck with some nibbles. Throughout the trip enjoy freshly prepared meals by our amazing chef, you can even have your catch prepared for dinner. If you have caught more than you can eat! take a few fish home to enjoy with friends and family. Remote locations offer the prime spots to hook a variety of quality fish. 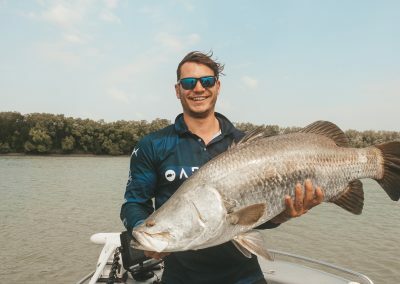 Depending on what time of year your charter commences you could be fishing the northern coast and estuary systems from the Cobourg Peninsula in ArnhemLand or down the west coast to the Port Keats and the Moyle Rivers. 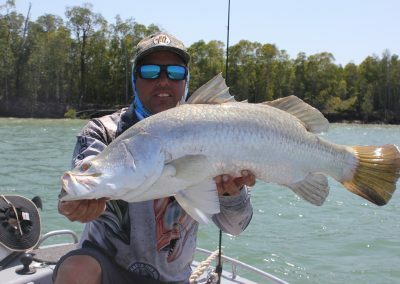 Whether it’s your annual getaway or a bucket list trip the Northern Territory fishing trip is the trip of a lifetime that will leave you with many enjoyable memories. You will be fishing for the elusive Barramundi and many of the sporting tropical species of the northern Australian waters such as Golden Snapper, Black Jewfish, Threadfin and Blue Salmon, Queenfish,Trevally, Rock Cod, Coral Trout, Mangrove Jacks and many more. 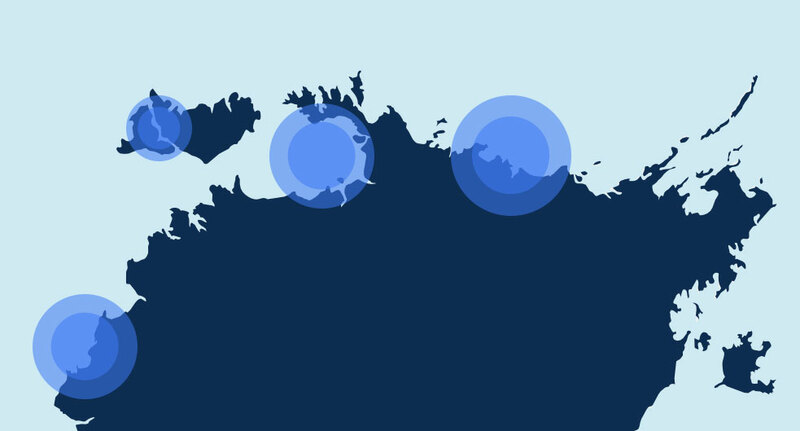 Depart Darwin. From the front deck watch the coast line disappear; you’re off on your fishing adventure! Dinner, a delicious meal prepared by our on board chef! Turn in for the night in air-conditioned rooms with full size beds. Arrive at location in the early hours of the morning. Get up all fresh ready for fishing the estuary systems. Enter into the great debate of who is going in which boat today! Breakfast before you head out. Boats are loaded with, morning tea, lunch, soft drinks and of course ice for the fish that decide to be dinner! Lunch, either come back to the Mothership for lunch or tuck into your freshly packed lunch while fishing. Come back relax with a cold drink and some nibbles and share fishing stories with your group. Freshen up with a fresh water shower before calling it a night/ or sit up in the saloon or on the top deck and chew the fat! Off for the day fishing. 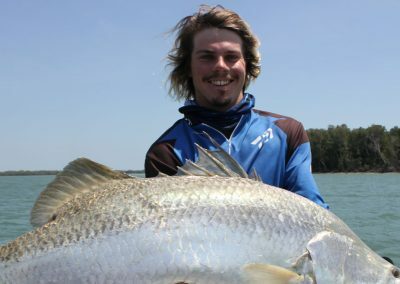 If the tides are right try some blue water fishing for Snapper or Jewies. Lunch; your choice come back to the Mothership or stay on the fishing boats. 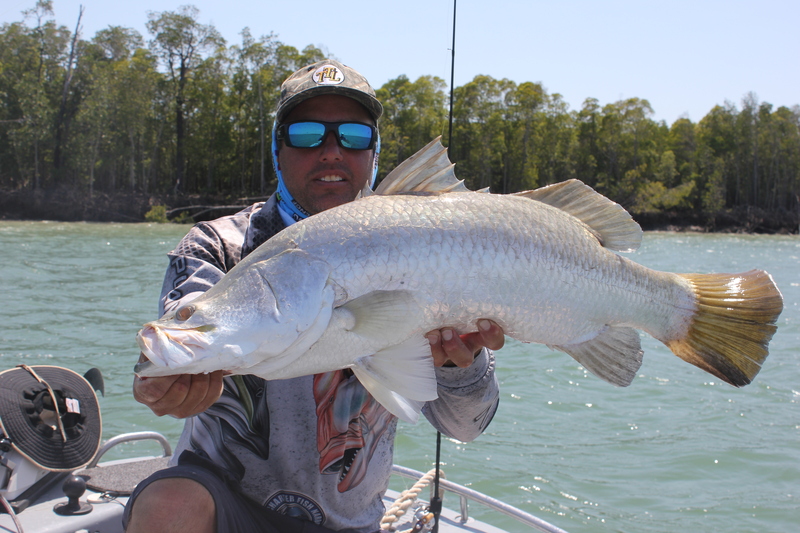 Once the tides have changed maybe a good time to head back into the creeks for some Mangrove Jacks or Barramundi! Enjoy the top deck with the group over some cold drinks. Dinner, and deserts you won’t be able to resist. Step off the Mothership and into your boat and head off for the day with ice, soft drinks and lunch packed. Lunch. Enjoy a freshly lunch made by our live aboard chef! Fish the afternoon then head back to the Mothership. Mud-crab for nibbles? it’s hard to take, I know. Dinner; want to have your fish for dinner, prepared by our chef? Yes yes yes! Head out for the day and don’t forget the pictures, friends and family need proof!! Lunch on board the Mothership or stay out fishing and tuck into a fresh lunch. 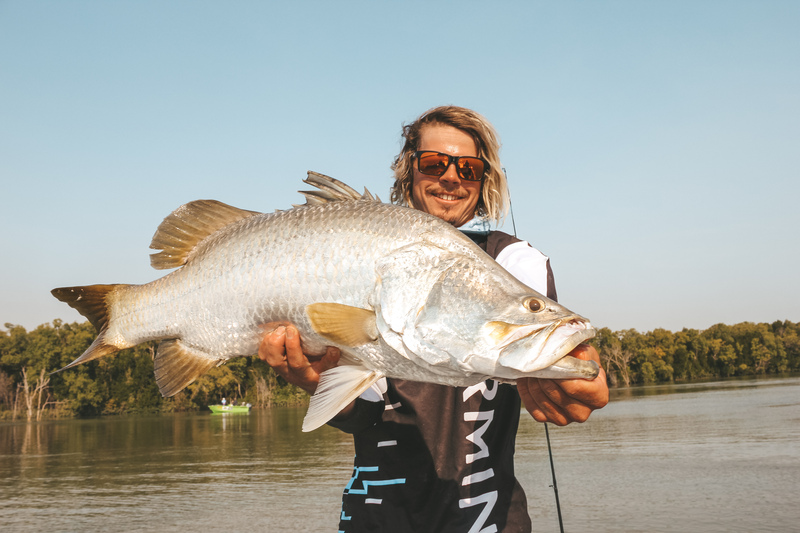 Crunch time, have you got the fish of the trip? Work that lure, convince the fish your lure is the one to take! Comeback to the Mothership, freeze some of the fish you’ve decided to keep. Freshen up in a cool fresh water shower, use the washing machine if you need some fresh clothes. Dinner in air-conditioned comfort after a warm day out on the water. Head out for the last hurrah! Lunch on board the mothership or stay out fishing and tuck into a fresh lunch! Dinner for our final night, cheers to our live aboard chef! 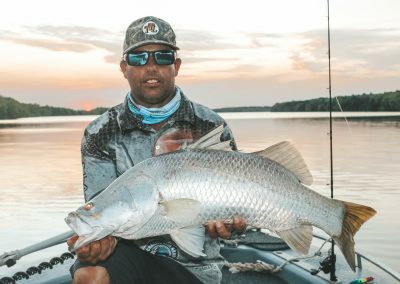 Load up any fish you have kept to take home with you and prepare for departure. Arrive back into Darwin harbour. Say our good byes and hope to see you again soon.